Alrighty. 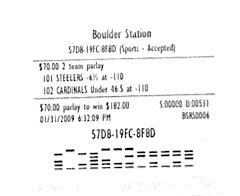 I've plunked down $70 on Pittsburgh to win by at least 7 and for the combined point total to be under 46.5 for the Super Bowl or, as the Vegas-hating NFL has forced the casino folks call it, the Big Game. $25 of that is allegedly my nephew's, should he actually send along the money after we lose. Right, Zach? Anyhow, both have to occur for us to win. If they do, we get $182. Or 2.6x our bet. Woo hoo. If I hadn't bet, I absolutely, positively wouldn't have cared what happens. Our studio is getting evicted! Ack! I can't get into the behind-the-scenes stuff, but our broadcasting home for the past 3.5 years is moving...and we don't know to where or when. That means we're not recording The Petcast this weekend and probably not doing The Strip either on Tuesday night. LVRocks.Com is on the hunt for some inexpensive office space to reconstitute, though, so if you have any suggestions, e-mail me at TheStripPodcast(at)aol.com. Here's this week's Strip Sense installment, a look at the one population that appears to be coming to Las Vegas more often these days and the interesting things the casinos are doing to cater to/appeal to them. Hmm. Let’s see. We’re in the worst downturn in decades. Gaming and traveler figures have plummeted by numbers so shocking that even the biggest pessimist does a double take. Mammoth hotel structures stand along the Strip stuck mid-construction to taunt a greedy, overreaching industry that didn’t plan for the possibility that the boom would ever slow. And me? I had to travel to godforsaken Battle Mountain, crowned by the Washington Post in 2001 as the Armpit of America but thriving now as the price of gold soars, to find a story on anyone benefiting from this misery. Yeah, Michael. I’d be surprised. Not just about who but by the very concept of good economic news. Hit me with it. We’ll get around to why this may be in a moment. But first, an answer to my—and likely your—first question: How do they even know? Here's this week's show! Apologies for the fact that my audio is so odd, but Phil's is strong and mostly clear. Click on the date below to listen or right-click and save to your computer. Or subscribe via iTunes here or via Zune here. He owns a record eleven World Series of Poker bracelets and has earned well over $8 million in his poker tournament career, but the reputed bad boy of Texas Hold ‘Em isn’t done yet. Phil Hellmuth, who has a forthcoming documentary and memoir, opens up this hour about his quest for bracelet number 12, about why he stormed off the set of NBC’s Poker After Dark two years ago and about what the 2008 World Series of Poker final table contestants did wrong. In Banter: Fishing in Vegas, an Ain't-Iowa mea culpa and taxing the brothels. Vegas is for...fish? The real kind? 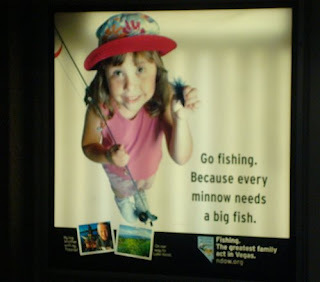 OK, so Miles doesn't think it's as weird as the billboards I snapped and showed you all at McCarran promoting Nevada agribusiness and restaurants that skimp on ice water, but the Nevada Department of Wildlife is now pushing fishing on tourists? Does anyone every come here and say, "Dang, I should've brought my pole?" Can't you think of a few better places to plan for a fishing expedition than this Land O' Manmade Catfish-Stocked Lake? 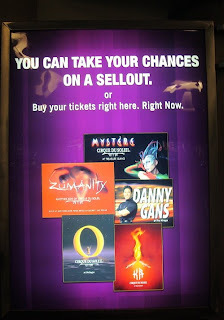 And either way, this billboard outside the MGM Mirage kiosk by baggage needs a little updating. Sure, Danny Gans has moved on and that's an obvious oopsy. But, also, what's a sellout? I hear they used to have such things, back in the day. 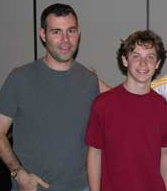 No, Jamie's not my son. But he has been my "kid" since he was 6. 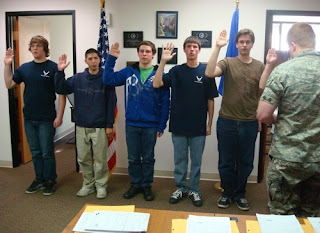 He made the decision to enlist not out of some overwhelming sense of patriotism but for the same reasons that prompt so many other young kids: He was utterly failed by the public education system and cannot afford college. He wants to do something with his life, and at 18 this is the best way he can think of moving forward. Indulge me -- or don't -- but it's quite an emotional experience for all of us. It was only yesterday that we were sneaking into pools on the Strip for a pool-rating piece I did for the LA Times and others. 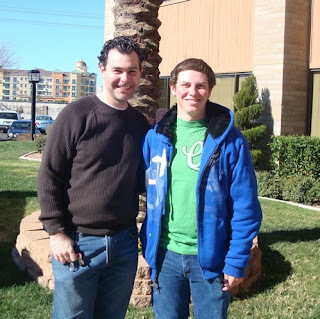 Then he also came along to rate Vegas wildlife for the same papers a year or so later. 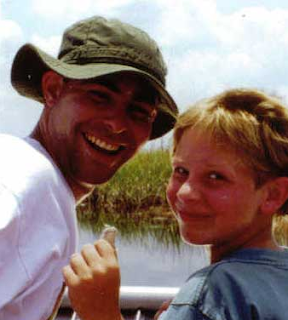 And I had to defend my very right to be his Big Brother in the BBBS program against attacks by gaybashers on CNN along the way, too. I'm sure he'll do OK. But it's scary. Also scary: What all that candy's done to me! Time for a diet and some boot camp for me, too! The New York Post is reporting this morning that Steve and Elaine Wynn are divorcing because he has fallen for a British woman in her 40s. 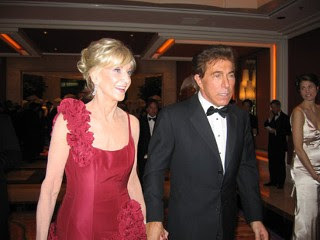 This news comes days after Mr. Wynn turned 67 at a gala put on by Elaine. It seems they've remained friendly. They're also still in business together; Elaine is on the Wynn board. 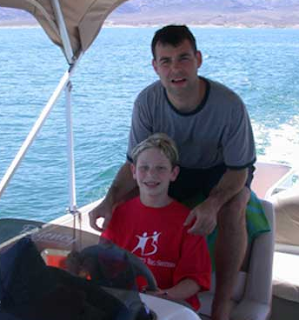 Not to mention, Elaine's nephew, Andrew Pascal, is the president and COO of Wynn Las Vegas LLC. Not sure there's anything more to say about it. I've already turned down a major gossip publication asking me to dig deeper into the identity of the woman. It's not my kind of journalism, so I won't be doing that. Phil Hellmuth, the winningest player in World Series of Poker history, is our guest this week to talk about how he won over his father, why he stormed off the set of NBC's Poker After Dark a few years back and what he thinks last year's Main Event final table participants did wrong. Plus, news from Vegas, a new poll, and some remarks on a little Internet controversy that has erupted lately. Join us at 6:45-8 p.m. PT at LVRocks.Com for the audio stream and live chat with listeners. Or pick up the podcast later in the week. Your call. 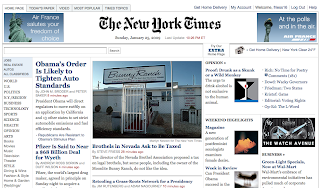 Still on vacation -- we're returning to Vegas this evening -- but I wanted to point to the piece I have in today's New York Times on the brothel industry's request to be taxed by the state and the state saying, a la Sarah Palin, "Thanks, but no thanks." Read it here. Above is the glory screenshot; the paper had the story out front for a while last night. I'm curious what you folks think about (a) taxing the legal brothels or (b) legalizing it in Clark County. Somehow, I've become the media defender of the notion of a mob museum in downtown Vegas. It's one thing when I choose to cover the topic in my column, since that's my choice. And it's not surprising that the national media would find the matter fascinating, too. But it seems to prove my point that everyone finds all things Mafia enthralling when even the LOCAL media wants to discuss it at length. I mean, it's local people/journalists who complain that the national media only take note of the disreputable sides of Las Vegas, right? Anyhow, if you want to catch up, you can click here on the image below and scoot up to about 12:20 for what becomes a raucous scrum unbecoming of refined PBS. In other words, it's fun. 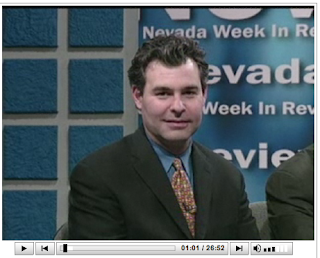 A few days later, in some new duds -- especially the dashing new tie -- Miles bought for me and with greater care given to my coif, my NWiR sparring pal Jon Ralston had me on his program, Face To Face on Las Vegas One, to hash it out again. Bob Stoldal, a legendary Las Vegas newsman and I believe former news director at CBS affiliate KLAS, is on the mob museum board. And while I believe the museum can be successful, I also kind of got Stoldal to admit that the tourist estimates for the Atomic Testing Museum and Springs Preserve were both inflated. He also doesn't quite explain where the Mob Museum will get its money from, since it's sure not going to be the federal stimulus package. 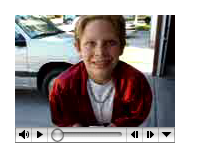 There are two segments, each about 9 minutes long. Find them here or click on the image below. Miles thinks I kinda look like a wiseguy. Add a hat and a violin case, ta-da. Were any of the mobsters gay? I mean, outside of on "The Sopranos"? Fun stuff. And now back to our vacation. Here's this week's column in the Las Vegas Weekly defending not the idea of stimulus money paying for the mob museum but the idea of the museum itself. Believe it or not -- and I didn't quite believe it at first -- lots of people think it would be a clunker with tourists. Every so often, I’m surprised to be holding a minority opinion among friends and journalism colleagues. There are truths that seem so blatantly obvious that it doesn’t even occur to me that anyone would disagree. So here’s one: A legitimate mob museum at the beautiful, restored historic old federal building Downtown would be an enormous success for Las Vegas. Now, that’s not the same as saying I support using money from the federal stimulus package to pay for the Las Vegas Museum of Organized Crime and Law Enforcement. Aside from the fact that I can’t touch that matter because I’ve been covering it as a controversy for some of my newspaper clients, I don’t have a strong opinion anyway. As I’ve covered that debate, though, I’ve been stunned to realize people actually question whether it could be an appealing tourist attraction. 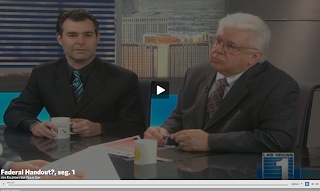 But the big epiphany came during last Friday’s taping of Nevada Week in Review, when I went 4-on-1 on this very question in a fiery scrum that resulted in 10 unusually entertaining minutes for PBS. Fox 5’s John Huck called a mob museum a potential “white elephant,” the Review-Journal’s Howard Stutz suggested it was Oscar Goodman’s legacy hail Mary, and show host Mitch Fox was baffled over what one would even put in such a place. And, most fun of all, Las Vegas Sun political maestro Jon Ralston nearly shouted his belief that people aren’t going to go Downtown for something like this.